Fayette/Westmoreland Forgotten History: NEWSFLASH: A Very Old Bridge Just Discovered!!! Hello, history buffs! YES, a Newsflash is a fair description what is being related below. I confess to resembling a bulldog, but only in habit. On the trail, sniffing away, chasing things around. When I am on the scent of unique significant items, there is no let up, hardly time to eat or sleep. And this time, ladies and gentlemen, I struck pay dirt! Scroll down to see the many photos I captured here near Dexter. Not long ago, I made a unique discovery! Just how important over all, remains to be decided. Maybe it's the hand of fate, or I simply got lucky. I do not claim to be knowledgeable on every aspect of the subject, but a very excited amateur historian who happens to run a regional history website. This is a fairly sudden experience, and was hurriedly undertaken, as I desire for my visitors to learn of this remarkable structure first! This is the type of object that has the adrenaline pumping. You will want to read on and understand this for yourselves. Coincidentally, I was exploring this area for an upcoming post on Kingview, and the Stauffer family. Now that must wait on a back burner. A similar post was being created in preparation for the West Overton area and the Overholts and H. C. Frick. Having so many irons in the fire proves one thing- I am keeping busy! Further information constituting the exact meaning of what was found at this place might yet become available as extenuating research, and will be added as need be. I have been deeply concerned with the task of other important posts lately and working much overtime on the job. This is a bit rushed. Any noticeable errors will soon be promptly corrected, warts and all. Whether this was a definite extension of the Turkey Foot Road, hopefully, time will tell, though it appears there is some evidence provided by Jeff Hann that there might of been a R x R spur from the PA railroad to the north running to the south and the Monongehala R x R ran through the area. This is almost precisely where the 'elevated road' is located. The difficulty arises that this is also where it is conjectured the Turkey Foot Road extended into East Huntingdon in Westmoreland County, on its course to Mount Pleasant. This would make gathering further evidence difficult. 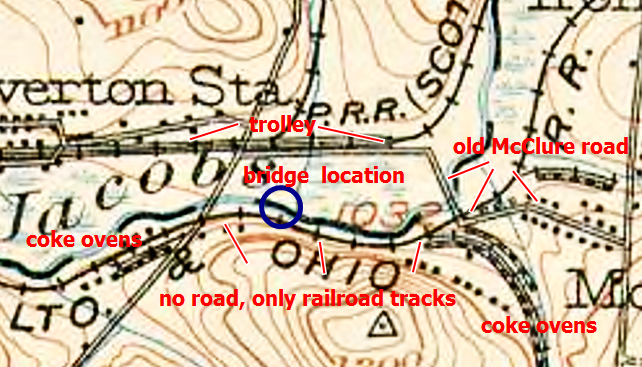 It has also been brought to my attention that this old bridge and elevated path might be considered to be only the old road to McClure and the Diamond Mines, down from the Dexter Mines, and probably nothing more. I relish the chance to put this to rest, and it is constructive for this post that the issue was raised. The McClure road led to the trolley station to the north of Jacob's Creek, where I have photos of the remnants of a very different type of bridge that crossed Jacob's Creek, made of concrete on the Iron Bridge article, "The Meeting Of The Townships", and some mentally sharp old timers made recent claims that it was used to go to catch the trolley, or street car there. (The names can be provided, if necessary). I haven't located a definitive map that includes this stone bridge near Dexter. Therefore, I entertain some doubts of any such theory. The stone blocks of this bridge, some of which appear roughly cut, do strengthen the case of it's vintage age. And I have observed the McClure bridge on one map, and as the McClure bridge was clearly still in existence at least by 1939, the year the overhead black and white photo was taken, and, I believe this is on later photos, but must check to be sure. Lastly, these people are in their 80's, so the recollections do substantiate the placement, direction and use of that road and compliments my contrasting view by the age of the photo of the McClure bridge. A little background is certainly in order. The Glade Path, or Pike from the east and what became Route 31, with Bouquet's route or Forbes' Road; The National Pike and aligning with much of Route 40; and the Ohio Company's and Braddock's roads, from the southeast were the first roads in our region beyond the confines of the Indian paths. With alternate route and branches in key areas, there was also what was termed. the Turkey Foot Road. Now, this was first cut and travelled, most likely by horse packers and traders, and then slowly improved for wagons and coaches starting in the early days of the mid-1700's on through the 1780's, 90's, and as the Ohio Company got involved in intrepid pursuit of road making in a parallel area, changes were made in the branches and routes varying here and there. The term originates from the appearance of a 'turkey foot' at Confluence, on the very border of Somerset County, basically from the south as the crow flies. The Laurel Hill Creek, Casselman River and the Youghiogheny flow through this old place known for it's Indians and the Sloane Ford. (You will find a few photos of this at Confluence I provided in Mr. Dietle's excellent DVD that is included with his book). These approximate directions can only be applied as spokes from the general border region of Westmoreland and Fayette counties. Of course, when observing a map from other places and states, you will adjust your position, accordingly. Granted, there are more early traditions that survived connected with the Turkey Foot Road due southeast toward Somerset County, with evidence of early Indian trails that were slowly cut and used by the white man for pack horses and eventually cleared for wagon routes. More knowledge has also survived concerning many of the Indian and trader towns further north near Pittsburgh and to the north and east toward the Susquehanna, Genesee area, Bedford and Lancaster. Much has been documented in Maryland, near particular and conspicuous places. This is a relatively neglected area in Fayette County; economically and to an extent, historically. There is some reason to conclude this road system was abandoned early with the creation of the 'chain bridge' on what is termed "old Rt. 119". Less tradition remains here compared to the more rural places like Jones Mill and Mill Run, etc., where the Springfield Pike, once known as the Clay or Mud Pike, was one of the main thoroughfares off the mountain to Connellsville. As I have been presenting here for a year, Westmoreland, as well as Fayette, have a rich past as proud and influential as most any in the nation, bordering on the gateway to the Northwest generally, and the Ohio Valley more specifically. More investigation is needed to dig down to deeper layers, and this endeavor is worth every effort. The hunting ground of the Seneca and the watery routes to the Mississippi River. A land of boundary disputes, fueled with Scotch moonshine and tempered with the admiring land surveys and excursions of our first President, no less. All this and surrounded by great states as well, Virginia, New York, the mounds of Ohio, West Virginia, Maryland. It appears likely that a R x R track once ran through the area of the elevated road. There is a fair amount of railroad and coke oven historical knowledge available in our region, to the degree that this hasn't been examined as heavily on this site. That may change in time, but I do concentrate on the oldest material I can reach when this appears pertinent. I feel that is partly the case in this situation. Instead of unnecessarily repeating myself with material from former posts, (SEO and Google can be a bit unforgiving for doing just that), I will gladly link you up with further information. Visitors will be well advised to check the February guest blog post of the author of "In Search Of The Turkey Foot Road", Lannie Dietle. I have had the privilege to collaborate with him. So much the better, in fact, for here is an exclusive interview on this very website that I also conducted with Mr. Dietle in September. This would be a good start for those who want to learn more of this subject. His website is referred to on these posts as well. ALSO, when you can, please check the post I uploaded on October 20, "The Braddock and Turkey Foot Roads", and from October 7, "The Lost Cemetery On The Braddock Road." These two articles will help clue you in for a broader scope of background information leading up to this post. Having said that, I don't envisage myself as any kind of expert on the Braddock and Turkey Foot Roads. Rather, my research encompasses and associates freely to the extent when it is encountered. I have made mention recently of this older layer of history. Forgive me if I make any repeated statements again, I'll try not to continually do so in the future, but it is hard to completely avoid. Over the months of combing old and newer books and recent research and such, looking in dim realms catching snatches of this or that, I learned more of many things, branching out into the very paths of comparative history, literal and figurative, to the very places often described here. So, from a minor chronicler of regional hamlets and musty archives, I felt myself transformed into a bit of an Indiana Jones for a day. This was accomplished simply by digging around Jacob's Creek for a few hundred yards. I would add this area near to East Huntingdon was not posted when the photos were taken. Frankly, I never dreamed of bing enabled to make a valuable contibution to the region. One subject earnestly delved into between blog posts, would be humbly, and sometimes closely, studying those that have been there with a broader brush and larger canvas while maintaining a semiautonomous position. Lannie Dietle comes swiftly to mind as the most recent of a long brilliant line, especially when we are talking of precise details and disciplined scholarship. He and his team's excellent and laborious work on this fascinating subject helped guide my instincts on one side, as time went on. I also felt curiosity toward the details of the historical underpinnings of the Braddock Road. The specific function and course have been plotted out in the past in many areas already. At the same time, I will be quick to point out, I make a habit not to limit my curiosity because of other influences. Independence can be a lonely thing. One advantage it holds is in keeping a clarity of self reliance necessary to form your own opinions and stand on your own two feet. For instance, I've included recent articles on the Braddock and Turkey Foot Road in October on the website where I struck off on my own a bit. Maybe I am sticking my neck out here farther than is usual. Admittedly, my main venue of research had naturally enough retained it's focus on the Westmoreland and Fayette County corridors and townships of this region's great addition to those days of awesome power struggles and stories of the French and Indian War, Pontiac's Rebellion, the Revolutionary days and the Whiskey Insurrection, to the coal and coke days, the railroads and into the 20th Century, and beyond. A natural progression. Nearby, were the expeditions of Trent and Burd, a glimmer of the presence of Daniel Boone; explorations and missions of a young George Washington. On my website are included some of my own ancestral material that is meaningful as it relates to certain aspects of local areas. I will be updating this in upcoming months. On the northerly route where the Turkey Foot Road crossed over the Chestnut Ridge, we find less to go on, only in old deeds and vague traces do we find a hint of the path. Nonetheless, we know from Washington's journals and many tidbits of historically significant and valuable writings that the roadways were much built and improved with military guidance with the trader and settler activity. Providence Mounts, of whom Mount's Creek was named, was one of the main protagonists associated with the northern branch of this "TFR". He and his name sake lived at Connellsville, in what once Bullskin Township, before the family traveled on and into the Kentucky territory of Daniel Boone and other early pioneers. During the Revolutionary War era he was given charge in this lengthy process by orders of Colonel Morgan, passed down the chain of command from General Nathaniel Greene, as advised by no other than George Washington. 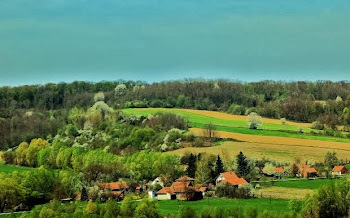 So he did much to develop one of the original roads in this broad region of rivers, swamps and mountains. A truly amazing achievement. This led to the successful northern campaigns of Brodhead and Sullivan against the British and Indians. It began at Cumberland as a military supply route, traversing parts of Maryland generally to the northwest and heading northerly into Somerset County and northwest to Fayette County of the State of Pennsylvania, in some ways rivaling the Braddock, or Washington Road and Bouquet's more northerly route of Forbes' Road. The route came through the mountains to Mill Run and Normalville and entering Wooddale via Hawk and Quail antecedents to the northwest. It ended at what was then, Fort Pitt. This road was much used by settlers to these counties, at least until the early years of the nineteenth century when with congressional approval, the National Road was put into effect and created. With the creation of the railroads, these thoroughfares took a back seat for many years until the days of the automobile. The bustling stage coach and wagon stands and noisy taverns saw little traffic and were slowly closed down. True, there are a few people of particular importance that weren't immediately filled in on this post. To you, I'm sorry this find had to be sprung it on you in this way. For better or worse, this was certainly meant as a surprise and called for a quick release. I personally am partial to surprises and this is an early Christmas gift! Again, the structural photos and location are released publicly because I received such swift responses for the request of experts in the field from The Pennsylvania Historical Museum Commission. They have a great site with the state archives and early documents. Also the Fayette County Historical Society. The involvement from those interested parties can be crucial to advancing this research. This is their pony show, and their due, if only they take advantage of it. I can surely use all the support I can muster. This is your history folks, and your region! Those of you who desire to become more directly a part of this fascinating find by sharing your own interest in this research, by all means, do pass on your stories and local knowledge by writing the above organizations in charge of the history of the state of Pennsylvania. Anyone with more info of this location can also leave a comment here, or you can e-mail me, (you'll find both contact forms below). The location of this old structure can be reached from Mt. Pleasant easiest by exiting US Rt. 119 south at the Scottdale exit, turning right on 819, and after a mile, make a left at West Overton on Overton Drive. After passing a stop sign you will cross the old street car track and come to Dexter bridge and the PA railroad with the old saw mill to the right. It is to the left down Jacob's Creek and the tracks for about 100 yards. It is 6.4 miles from Connellsville where from Rt. 119 north, you will take the next exit past the Everson exit to the left at the stop light, up Walnut Hill and down into the Kingview valley, making the next right to Dexter Road. This will lead you to the train tracks and the location is to the right after traversing a small steep hill. The basic coordinates adjusted for online searches are 40.106458, -79.570136. With the recent work of Jeff Hann of Bullskin on the area of the TFR up near Quail HIll Road toward the intersection of Spruce Hollow Road and Breakneck Road in Bullskin Township, I too, had the opportunity to walk an historic branch that is surely closely connected with the Turkey Foot Road. Mr. Hann was responsible for bringing this find into the realm of documentation and making contact with the website by e-mail. Truly his contribution is such a bonus. And with guidance lent from Lannie Dietle, (who is including the information as an addendum to the fourth edition of his book), will very soon be covered in detail on this website. and hopefully, elsewhere. Over the mountains this road was cut from the Normalville area to Hawk Road and on toward the Quail Hill Road area where you find Shultz Lane near the old Smith surveys. Here where there appear to be traces and evidence od the roadbeds were recently visibly discovered, the basic road is estimated from the year 1794. Running on to Shenandoah Road, where my great, great grandfather happened to place his residence, theoretically, it moved through the hilly draw toward the Gault School Road to where the old trace had crossed Mount's Creek at what last went by the moniker of Spaugy's Milll as was the old road name there near where my grandfather lived. The oldest name for this mill was Cathcart's. From there the Turkey Foot Road meandered on a course to Jacob's Creek, bypassing the Braddock Road to the northeast, yet crossing it for an apparently easier, dryer route and on toward the north and the Mount Pleasant area. This specific research would hardly of been possible without the knowledge given previously of, "In Search Of The Turkey Foot Road' to prod me to make my find a reality. I began this specific search while finding extra hours to check this out and the more interesting this became. Here on the borders of these townships, a part of another road that vanished that once traveled down Walnut Hill from the south, and yet another road, wending it's mysterious way up Walnut Hill from the east. This is where I concluded one would of crossed the other before meeting up later. Traditionally, the Turkey Foot Road headed into Westmoreland County on a different route. From a 1939 survey of black and white photos and consulting old maps, there is some substantial traditions on the edge of what was Tyrone township. From the south near Everson and the Bullskin, Upper Tyrone township line, arriving from the Wooddale area, the two routes meet. Here, in what is now such a hamlet that is deceptively normal, was a secret piece of the Braddock Road, and a very likely route of the Turkey Foot Road. So, thank God, I decided to walk through the bramble and thorns of centuries. A player, and no longer just an observer. Taking a closer look at this surprising region of the deep Connellsville Coal Fields, with it's multi-layered historical tapestry marred by much of the very subject it was an historical part of. Too much history! Imagine the irony. To the point that anything beyond the train tracks and strip mines is difficult, nay, practically impossible to fathom. Here I believe I got lucky, and at the same time, downright nosy. Impetuously, I simply determined to search out what I could with little thought of what waited hidden. With this discovery, or possibly, re-discovery, though it would be an unpopular decision, I was adamant to not IMMEDIATELY divulge all the details of the exact location UNTIL proper authorities were informed and brought to the knowledge of it. That was the position taken. The above is adjusted slightly from what I wrote a few days ago, before gaining some assurances from the proper authorities this will, indeed, be investigated further. As I am satisfied to of gained more interest, I am happy to get this off my chest in revealing the whereabouts of this old stone bridge and wall remnant that lurked under our very feet all along. So very close, but buried for many years. Neglected, lost and unacknowledged. As much as could be ascertained, the old bridge was languishing, completely forgotten, as if caught in a time warp, and had never existed. Though there was some cut stone work in the late 1800's, and depression era, such as the Cunningham bridge remnants near Creek Hills that had concrete abutments, and obvious stone block supports on BOTH sides of Jacob's Creek, this structure certainly has little appearance of modernization connected with it's origins. The angle of the projected crossing is somewhat unique as well. The fording area has a similarity to the Sloan Ford crossing at Confluence in my opinion. But, as I stated, this requires more careful verification, and possibly, excavation. So I stepped toward legend and found a bridge to the past. Literally. From our way of peceiving what is valuable, this is better than gold or silver. The old saying is appropriate here, "I was in the right place at the right time." This does give you folks a good idea of what might well be right around the bend, and ,as often stated, 'down the road.' Who knows what else can be found? So, keep your eyes wide open and when something looks old and neglected in your neighborhood do try to check it out. The ideas that ran quickly through my head. DO you want to be privy to my thoughts? I wondered if my parents guided me to this place to finalize a category of old history that had entranced and obsessed me to no end for months and months. Ask anyone that knows me personally at how consumed I was with the varying levels of our local history, and they would be sure to confirm this is no exaggeration. Or, this was simply facilitated by a chance encounter on a small excursion, and that was that. The mysterious moving of what we call chance, fate and luck do occasionally give a more than casual entrance into and out of our lives from a rarefied viewpoint. Regardless of these random musings, I am satisfied in the sense that my late night readings with old books off and on for the archaic space of forty years and collaborative involvement with others of like mind, with the aim of this fairly new website, led indirectly to this investigation. I ask, does this have the appearance of a railroad spur? No mortar or concrete here. You can decide. One thing I can relate with some confidence, concerns Mr. Rob Doolittle of the CSX in Fayette County, who informed me, in response to my inquiries on the subject, that he has no evidence of B&O involvement with this structure from the property department archives. That research is highly appreciated. Much might be conjectured and realized over time about the usages of our Jacob's Creek site. What we can document with alacrity and assurance is this: an old partially crumbling, stone bridge exists at the location. The noticeable crossing alignment. The fording area without a hint of stonework. The relatively small size of the blocks used. The lack of observable pylons or stumps as in other places near here. The interfering elements of railroads and mining operations, saw mills and coke ovens. The tight fitting stone wall. The elevated road, possibly from the West Overton area, but likely from the 'Mon' railroad which somehow passed through parts of what contained swampy places. Quite a feat of engineering. And the absence of mortar. It should only require stating this once, all will agree, what the bridge and wall unquestionably are not, are hypotheses, theories, or probabilities. Whatever their exact interpretation in the historical record, they are there to ponder. As was prominently claimed for this area of Jacob's Creek, this is presumably very near where Judge Veech said the Turkey Foot Road crossed Jacob's Creek "about a mile below the chain bridge", (Iron Bridge), and a few others made similar claims, are the cut stones of a bygone age, where they were partly uprooted by trees and falling into the stream bed. 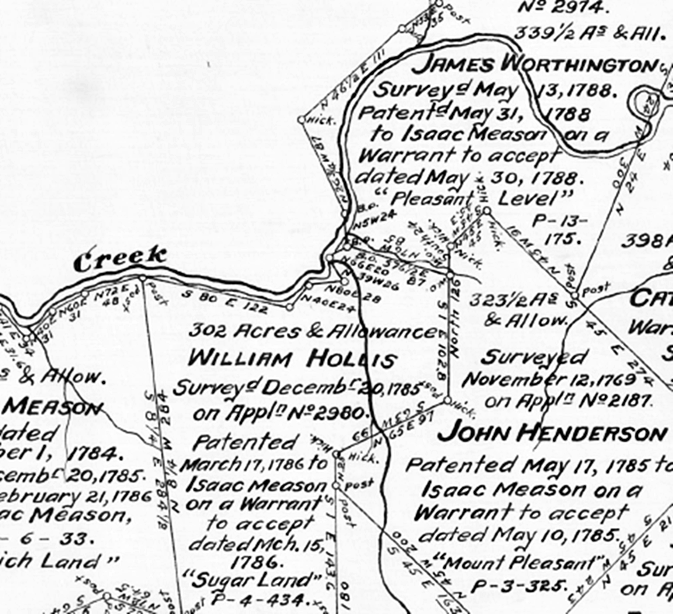 Franlin Ellis on page 756 of his book, "The History Of Fayette County", when referring to the route of the TFR states, "...it bore to the northwest across Chestnut Ridge to Mountz' Creek, which was crossed at Andrew's, (now Long's mill); then northwest across Bullskin to Jacob's Creek, in Tyrone, intersecting Braddock's Road near the old chain bridge." The coincidence, if you could call it that, is very striking indeed. This must be taken seriously as circumstantial evidence presents itself. It is possible many of the bridge stones were removed on the Westmoreland side, if there ever were any in the first place, but this is unconfirmed. Again, it is to be kept in mind the elevated East Huntingdon township road may not be directly connected to the bridge and where it crossed. As near as I could ascertain, the stone bridge road on the Fayette side is, approximately, 20 to 25 yards of stone blocks. This is not a large width or huge blocks usually associated with a railroad which suggests an earlier verson may lie near here or under this bridge. The structure may of been used for other purposes, which is always a remote possibility. This could include mining purposes or hauling material. That wouldn't necessarily take away from its being a candidate for earlier historical importance. I noticed no pylons or abutments in the water myself, as stated above. Does anyone recognize the type(s), of material you observe here? 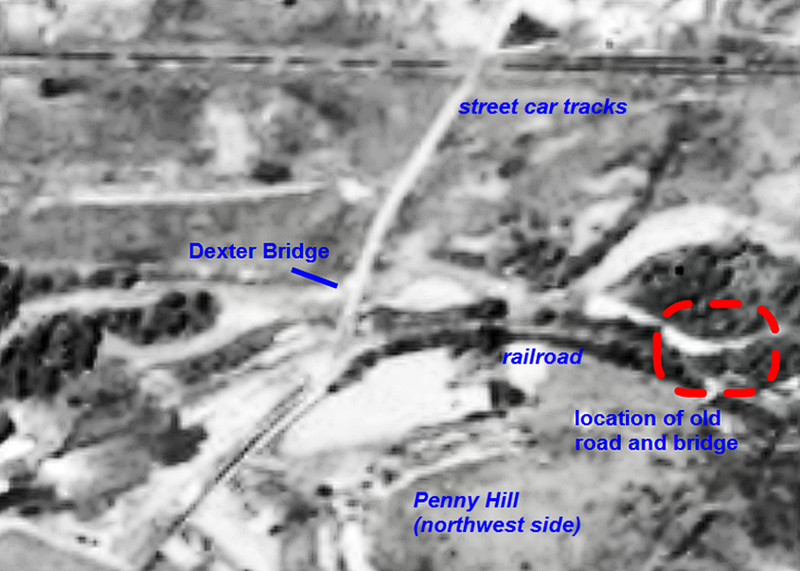 From the trajectory of the stone roadway toward Dexter, the descent to which appears from the south around Penny Hill above the old bridge and to the north. By this observation, the report of the Walnut Hill area, is considerably strengthened, near where the Turkey Foot Road is said to of crossed the Braddock Road which was presumably, laid partially on a branch of the Catwba Path from the Narrows near Connellsville. The circumstantial evidence grows more clear. On the photo below this elevated path or road, does not appear to derive directly from the creek bed, but an indeterminate distance to the west. The significance of this oddity, or lack of any, is not yet completely understood. It may inply the fording site, or bridge roadway toward E. Huntingdon is separate from the elevated road. This would further the probability it is a piece of the Monongahela rail track and less indicative of a link to the Turkey Foot Road crossing. The road on the East Huntingdon bank of Jacob's Creek travels toward the east from parallel to Jacob's Creek and is not covered in, or made of any stone, as well as I could observe. As stated elsewhere, an outside chance exists this road was indirectly connected to the old cut stone bridge, though, this is less attributable to a haphazard occurrence. Below is the clear image of the uniquely angled road way continuing from the watery depths. The elevated road runs from farther to the left of the photo which might be puzzling. In recent memory, the creek was much higher before dredging. The fording site might not be directly connected to the bridge structure we see today. Above is a clear photo of the stacks of stone work toward the stream near the northeast corner of Upper Tyrone township in Fayette County, PA. So, there you have it folks; kit, bang and caboodle! This has all the look of real age, and one could conjecture it was placed long before the modern Dexter Road and Overton Drive and the railways, Dexter Mines and the coke ovens were put into use. This would incorporate additional support as a serious candidate of the route of the Turkey Foot Road at the very place it would of had to cross by taking the circumstantial considerations seriously while including the research and tradition of Veech and Ellis. The path of the road on the other side may well be older, as a part of it approaches from the west beyond the area of the decrepit bridge landing area, though it might be connected later to a railroad. The deep stream might of beeen forded for some time and then bridged by Providence Mounts, as his militia assisted. Or it might of been built by others from this area, possibly the Stauffers, early pioneers here.The stones could of conceivably of been brought a good distance. There are no well known areas where stone of this type should of been hauled from in this vicinity. There is the Quarry Street area at Mt. Pleasant as a remote consideration. There is some reason for a supposition of a previous bridge even more primitive than this, if you can go by other crossing sites. This is only speculation. Appropriately, I might throw into the mix, that Indian artifact collector, Duaine Fouss claims that this area was populated long ago with Indians. There were unverified stories Abraham Stauffer had relations with local tribes. He was a majpr personage in what became the Kingview area of Stauffer's saw mill and further up Dexter was the grist mill, giving a hint of things to come. This can help pin down some evidence of the age of the road. The Turkey Foot Road was part and parcel of the migration into the Ohio country. Unfortunately, the traditions concerning what could be termed the old Turkey Foot Bridge, are lost here at the border of Fayette and Westmoreland Counties. With the sturdy nature of this type of structure, this is different evidence than a landscape scar, however appealing and meaningful. Here we are on the firmest of ground. A veritable document in stone. I am adamantly thrilled to of been able to bring this to the attention of others with a degree of relative accuracy. Remember, YOU have been the first, so far, to of shared in this find, whatever the potential importance. This is an historic occasion in the existence of this old cut stone bridge, with evidence mounting, and correlating to a famous old road. It is time to finalize contact with the Pennsylvania Historical Museum Commission, state archeologists, and Laurel Highlands.org, etc. Those experts will be tasked to undertake a proposed further investigation of this road and bridge. We can anxiously await further revelations. First and foremost, we need experts to verify it's age and archeological work is required. Not many ancient bridges are discovered anymore. This is just what we need for better verification. Serious attention is a must by the authorities on such matters.